I'm not a big fan of the Biggest Loser. For those of you who aren't familiar with it the Biggest Loser is a "reality" television show that features extremely overweight folks living on a ranch for 6 months and undereating and overexercising in order to lose weight and potentially win $500,000. Not exactly the reality that most of my patients face. In terms of the show's participants life post-show is a mixed bag. Some will parlay their weight loss into new lifestyles and in some cases, new careers. Unfortunately others won't fare as well. Now while it's certainly true that there is recidivism with all weight loss programs my beef is not that contestants regain weight, it's what they're taught. 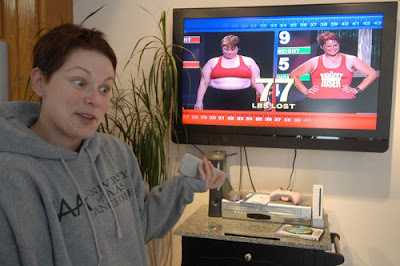 Watching the Biggest Loser I can't help but feel that the message it ultimately teaches is that all weight is bad and the scale is the only determinant of how you're doing. I think scales tell you what you weigh whereas you tell yourself how you're doing, where how you're doing depends on what you're actually doing. Are you eating in a manner that is both healthy and enjoyable? Are you exercising as much as you can happily include into your busy life? "The philosophy of the show -- to radically change diets and exercise patterns of obese people -- seemed to have a hidden message about her character, Zwierstra said. It seemed to say that weakness made people fat. If they just had discipline, if they weren't lazy, they could be thin." There was a video too - I've included it below. Sadly it's a lot more real than the Biggest Loser will ever be.